2. What were the most enjoyable or memorable parts of your trip? This is a difficult one. It was all superb. We expected enchanting scenery, and the people turned out to be the best part. 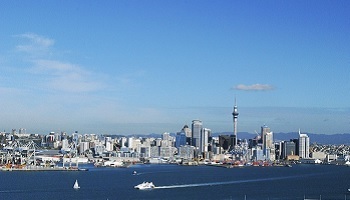 We flew business class on Air New Zealand. We had never flown on a flight that long. With all their service, amenities, good food, and a comfortable seat that made a bed, the flight went by very quickly. We started in Auckland at a great B & B, The Great Ponsonby ArtHotel. Our travel agent, Phil, had thoughtfully arranged for our B & B room to be available for our very early morning arrival in case we wanted to freshen up or nap. Wow, what great breakfasts and services at this B & B. The hosts even drove us to a site a couple of times, in lieu of a taxi. Great start for our trip. We then had a 12 day cruise on the Oceanic Discoverer, a small ship, with Coral Princess Cruises out of Australia. We love small ship cruising, and this one was fabulous. Food was delicious, crew most caring, passengers were fascinating and friendly. Guides were very knowledgeable. We were treated to impressive lectures and PowerPoint presentations on NZ history, Maori people, fauna, flora, volcanoes, earthquakes, important conservation efforts and more. Fun Shore excursions included a visit to a live volcano, an informative and fun visit to a Marae, wine tasting, bird viewing, historic sites of Cooks explorations, swimming with dolphins, visit to a sheep ranch, and, of course, some shopping time. The days were packed with fun, great people, great excursions, and, need I say, scrumptious food. The Cruise ended at Milford sound (a beautiful area). 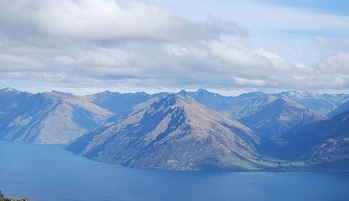 Our next stop was Queenstown. We stayed at the Dairy Private Luxury Hotel B & B. The key word here is Luxury. Paul and Matt where exemplary hosts. Their afternoon tea, with homemade sconces and treats, was elegantly presented and yummy. The location was good, near the Bird Sanctuary and the Gondola. The only drawback was a 5 flight of stairs down to town. There was a ramp that zigs-gaged down for us old folks. We took the old 1900’s steamer to a farm for a sheep herding, shearing, and a BBQ lunch. That was much fun! After Queenstown, we spent one night at Fox Glacier. The accommodation there (Te Weheka) was Ok, more like a motel than a B & B, but comfortable. The best part there was they had a washer and dryer for our laundry. We did not try to go out to the Glacier. Been there, done that, and the weather was not cooperating. 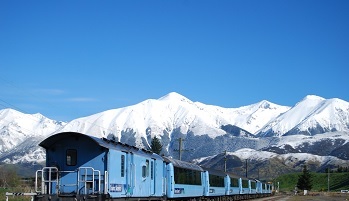 From Fox Glacier, we went to Greymouth, where we boarded the TranzAlpine train to Christchurch. The NZ trains are super. They were comfortable, offered food that was edible and even tasty (said she who tried a horrid pork pie on Brit Rail in England)! The attendants were gracious and helpful. My husband and I got a laugh out of the “Disabled Toilet” on the train. What is wrong with it? Who disabled it? In the US, it would be labeled for the handicapped. The scenery on the trip across the Alps was magnificent. The train spiraled up and down. We arrived in Christchurch very late and left very early. Julie at our B & B, the Orari, was very accommodating with our schedule. I believe I would have liked to spend more time there in her B & B, but Christchurch is not really ready for tourists after their devastating earthquake. From Christchurch, we rode the Costal Pacific Train to Blenheim. The scenery was colorful and fun. I believe the trains were a good choice. Both my husband and I got to enjoy the scenery rather than being concerned with driving on a different side of the road and trying to finding our way. In Blenheim, we stayed at the Old St. Mary’s Convent Vineyard Estate. The B & B was elegant. I found the hostess, Maria, especially friendly and helpful. Of course, since she had cats, she was my immediate friend. J The grounds and gardens were so peaceful. My husband loved his walk in the morning among the exquisite gardens. The B & B is situated among the picturesque vineyards. We marveled at how straight the seemingly endless rows of vines appeared. While in Blenheim, we had the opportunity to spend time with a relative we had never met. That was special. From Blenheim, we went to Picton and boarded the ferry to Wellington. Again, we marveled at the lovely scenery. We again traveled by train back to Auckland. We had an overnight back in the Great Ponsonby Arthotel. Gerry’s breakfast was still a highlight.Then the flights home to Texas! The trip exceeded our high expectations! 3. Your overall comments on the trip and the travel company? Phil at Aspire Down Under was an impressive agent. He was prompt in answering emails. He quickly learned what we wanted and planned accordingly. Our total trip was about 28 days, and it was spectacular! We cruised; we road coaches and trains. We stayed in lovely B & B’s. We saw fabulous scenery. Met some family we had not seen before. Ate excellent meals. Everything went exactly according to Phil’s plans. He provided a most comprehensive itinerary, with no detail overlooked. No glitches or problems. I would say that was pretty damn good for an Australian man in New York, working via email with 2 Texans, for a big bucket list trip down under! Phil was an excellent and thoughtful communicator. He even emailed us on the trip to be certain we were OK after the Earthquake in Wellington when we were there. (We were in a Pub and missed the whole thing! LOL) I would recommend Phil and Aspire Down Under for anyone wanting a great experience in their areas of expertise. 4. If you could take your trip again, what would you do differently? I would go when we were younger (I am 72 and Dave is 61). It was all so great, and I would have liked to have more stamina to do even more.